The weekly Karavan+Ya (Caravan+Me) published in the Russian city of Tver became widely popular seven years ago when it was first to report about a monster from Lake Brosno in the Andreapol District of the Tver Region. After the first publication in the weekly, the news about a dinosaur from Brosno spread all over the world. Journalists from Moscow and from abroad were seeking sensational publications about the monster from the Russian province. Hundreds of publications and TV programs about the Brosno monster made the creature a world sensation. The Tver weekly Karavan from time to time organizes small expeditions to Lake Brosno to visit the mysterious creature that became so much popular thanks to the newspaper. Numerous witnesses say that they saw a head of a big beast above water that looked like a dinosaur or a dragon head and a long thin tail. The people said that the creature was covered with scales like a reptile and was about five meters long. Experts of the Kosmopoisk research association went for an expedition to Lake Brosno together with Karavan in the summer of 2002 and did echo deep sounding. Vadim Chernobrov, the Kosmopoisk coordinator said in an interview to the Moscow newspaper Argumenty i Facty (Arguments and Facts): "Echo deep sounding registered an anomaly. There was a huge jelly-like mass of a railway car size handing five meters above the bottom. The mass stood motionless. We waited for some time and then decided to make it move: we threw an underwater petard, a low capacity explosive device. When the device blew up, the creature started slowly going up. We starred at the water, and it was clear; there was nothing resembling a monster, however something unusual was still felt in the lake water." Researchers, who believe that a mysterious big creature does live in Lake Brosno and who work on the mystery of the creature, say that Brosnya (this is the name given to the monster) cannot be a reptile. Otherwise, it would be frozen and died in the climate of the middle geographic zone when dormant. If the strange creature has come to life, it means it is a mammal and breeds through syngenesis. However, some problems arise in this connection. First of all, the lake is too small for an entire population of large predators to live and breed there. Second, a group of these big mysterious creatures needs much food, which is also a problem in the small lake. There is a hypothesis saying that some water systems join lakes, seas and oceans. 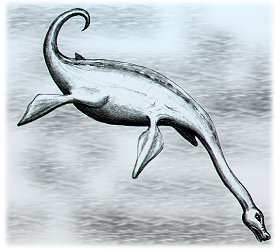 If so, Scotland's Nessy may be a relative to Brosnya living in Russia's province. It is rumored that the strange giant creature has been living the Lake Brosno for several centuries already. One of the legends says that the lake monster scared to death the Tatar-Mongol army that headed for Novgorod in the 8th century. Baty-khan stopped the troops to have some rest on the sides of Lake Brosno. Horses were let to drink water from the lake. However, when horses came down to the lake, a huge creature emerged from the water roaring and started devouring horses and soldiers. The Baty-khan troops were so terrified that they turned back, and Novgorod was saved. Old legends say that some enormous mouth devoured fishermen. Chronicles mention some "sand mountain" that emerged above the lake surface from time to time. Once, Varangians wanted to hide stolen treasures in the lake. But when they approached the small island, a dragon came to the surface from the lake and swallowed the small island up. The terrible monster disturbed people's minds over the 18-19th century. It was rumored that the giant creature emerged on the lake surface in the evenings, but immediately submerged when people approached. It is said that during WWII the beast swallowed up a Fascist plane. Today, there are lots of witnesses who say they chanced to see Brosnya walking in the water. People say that it turns boats upside-down and has to do with disappearance of people. Everything said by locals and tourists who witnessed Brosnya proves that the creature (either a dragon or a dinosaur) does exist. However, some people treat the issue skeptically and still say that the creature may be a mutant beaver or a giant pike of 100-150 years. Others conjecture that groups of wild boars and elks cross the lake from time to time. Do boars and elks dive and stay under water for a long time? However, local people witnessed neither boars, nor elks, and the Karavan newspaper and other expeditions spoke about some other creature. There are some more scientific hypotheses concerning Brosnya. One of them is a gas version saying that when hydrogen sulphide goes up from the lake bottom it makes water boil up; this boiling in its turn resembles a dragon head. But the amount of hydrogen sulphide must be considerable to produce this effect. Other version says that there is a volcano in Lake Brosno that makes ejections on the water surface from time to time. It is well-known that there are several fractures at the bottom of the lake, the depth and the direction of the fractures cannot be defined. It is not ruled out that the volcano crater is inside of one of the fractures. This explains why the volcano, if it actually exists, has not been discovered yet. Fishermen say that the underwater world of Lake Brosno has a structure of several levels. From time to time burbots and perchs can be found in the lake. This is strange at all that some sorts of fish can be found in the area at all. For example, herring can be found in a lake in Peno District in the Tver Region. This is strange that the sea fish may live in the lake at all. Smelt shoals from time to time can be found in Lake Brosno as well. The phenomenon of Brosnya can be explained from the physical point of view: huge smelt shoals are reflected on the water surface through refraction of light and produces the effect of a huge reptile head. Physicists say that any mirage appears in hot weather. Indeed, witnesses say that they came across Brosnya in summer. However, origin of the strange monster is still a mystery. In November 1996, the Karavan weekly started an expedition to Lake Brosno in the Tver Region. The expedition consisted of writer and journalist from Tver Yeugeny Novikov, head of the Tver Regional Legislative Assembly's press-service Nikolay Ishchuk, journalist Marina Gavrishenko, photographer Anaida Jilavyan and editor-in-chief of the Karavan newspaper Gennady Klimov. In seven years after that expedition, we would like to know whether the people believe that the creature actually exists. Gennady Klimov says: "The lake actually keeps some secret. When the depth of Lake Brosno was measured, it turned out that in some parts it was 120-160 meters deep. It means that Lake Brosno is the deepest in Europe. What is more, the lake belongs to the preglacial epoch that is why mysterious phenomena are quite possible in it. As for me, my concerns about the whole of the story are quite particular. I am interested in the mechanism according to which global myths arise. I say that the administration of the Andreapol District where the lake is situated could have been more adroit to form economy of the district depending upon the Brosnya myth. Today, I do not personally care if the creature exists or not. But this is a really precious myth from the point of view of the future. Much is spoken about monster called Brosnya in different parts of Russia and in other countries, but nothing is said here in the Tver Region where the creature "lives". It is believed that Loch Ness creature does exist. The whole of the county where is lives is connected with the creature myth. The nature here in the Tver Region is wonderful and pure. There is a unique technology of making and using myths. These technologies will be extremely important in the future." Marina Gavrishenko, the journalist who took part in the expedition says: "At first sight, the whole of the monster story looks like a fairytale. After the expedition to Lake Brosno, I do believe that the place is actually mysterious. Stories told by witnesses prove this opinion. We met with local people who were perfectly sane and adequate. What is more, all legends about the mysterious monster trace the roots back to the old times. I am sure that legends and rumors cannot arise from nothing." Nikolay Ishchuk, the head of the Tver Regional Legislative Assembly press-service says: "I do not believe in wonders. What we chanced to see at Lake Brosno is actually mysterious and incomprehensible. If the phenomenon can be explained with the laws of the planet's life, I believe this is a miracle indeed. I recollect our expedition to Lake Brosno and our attempts to take pictures of the creature as a wonderful journey. This is wonderful that people may have such interesting adventures. May it be so that the expedition actually came across some miracle? Inexplicable things must exist in this world. When people do not understand some things they want to know more and reveal more new facts."